Songs, music, and dance are an integral part of Holi celebration in India and speaking of songs and music how can one forget the immense contribution of Bollywood and the peppy Holi numbers it has given to us. 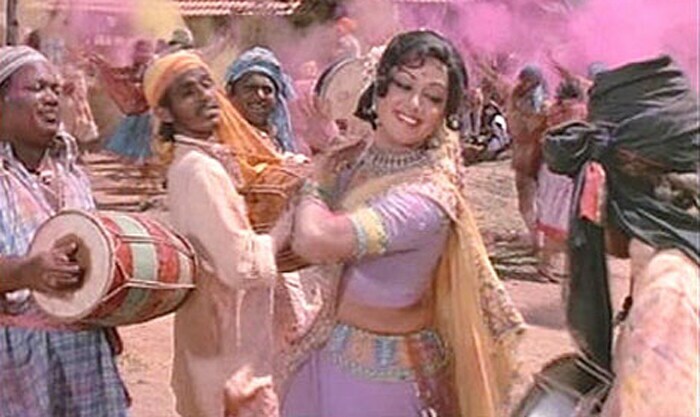 Bollywood has typically portrayed the mood of Holi from time to time with the hero and heroine getting drenched in colour waters accompanied by hundreds of dancers making merry in the background. These songs have also been instrumental in rendering a folk touch in the film. Songs on Holi have made them all the more popular amongst the masses so much so that the famous Holi numbers have become as much an essential part of Holi celebrations as the colours themselves. Speaking of famous Bollywood Holi Songs, how can one not start of with Rang Barse from Silsila, which is considered as the Holi anthem of India. The songs brings in the essence of Holi, a festival which gives everyone an opportunity to shun away their inhibitions and lets you wear your heart on your sleeves. Here is the video of Rang Barse from Silsila in case you do not have it on your playlist yet. All of us remember “Gabbar Singh” of Sholay asking his sidekicks time and again “Holi kab hai, kab hai holi?” in his stern voice. And that would also send across a chain of thought leading to the famous Holi song in the movie Holi Ke Din featuring the power packed couple Dharmendra-Hema Malini and their unmatched chemistry. Here is the video of Holi Ke Din in case you do not have it on your playlist yet. Yet another gem featuring the angry young man of Bollywood, Holi Khele Raghuveera is a song from the film Baghban was an instant hit. Inspired by a renowned folk song, Holi khele Raghubeera..awadh mein Holi khele Raghubeera, the song tried to re-create the magic of Rang Barse from Silsila, a song which was penned by the late, Harivansh Rai Bachchan. Here is the video of Holi Khele Raghuveera in case you do not have it on your playlist yet. This song from Mohabbatein finds its place in every Holi party as it sums up the flirty air that surrounds every Holi celebration, where boys try to woo their beloved, while splashing colors. The spirit of youth and love comes alive in this song. Make sure you include this fun and catchy number with lovely and peppy lyrics, to add to the joy of the colourful occasion. Here is the video of Soni Soni in case you do not have it on your playlist yet. This peppy number which has Akshay Kumar flirting and inviting Priyanka in Waqt: The Race Against Time, to join the Holi celebrations is something you could use this year along with the “Bura Na Mano Holi Hai,” excuse, which is a successful excuse from soiling the clothes of everyone with a splash of colors. Here is the video of Do Me A Favour Lets Play Holi in case you do not have it on your playlist yet. This one from Yeh Jawaani Hai Deewani is the coolest and hippest Holi song ever.Although the movie had nothing to do with the festival and the movie released nowhere during the festival yet to add colours this song was somehow incorporated into the movie. The catchy lyrics are sure to grip your attention, while Deepika and Ranbir look amazing in this colourful number. Here is the video of Balam Pichkari in case you do not have it on your playlist yet. If you wish to make your Holi Party all the more steamy and fun do not forget to include, Lahu Munh Lag Gaya from Goliyon Ki Raasleela Ram-leela. The songs features, the ever so stunning actress Deepika Padukone alongside Ranveer Singh in this ultimate sensuously shot romantic song, which has the artistes playing with colours elaborately in typical Gujarati backdrop.The song and the visuals are amazing and are sure to rock your Holi party. Here is the video of Lahu Munh Lag Gaya in case you do not have it on your playlist yet.